Purchasing a pottery wheel is a major stride that can be fairly intimidating. There are various factors you have to consider before settling on the choice of buying your first pottery wheel. Here are a few components to remember. Your pottery wheel will be a fundamental part of your work as a potter. Decide on the requirements you wish to have in a pottery wheel, then search for the wheel that best meets your needs, at the best cost. Pottery wheels are a noteworthy investment; be sure to do your homework and do comparison shopping to ensure you get the most for your money. Check with a few online providers, and local art supply and ceramic shops. Keep in mind to think about the cost of shipping in addition to the pottery wheel. Anticipate that pottery wheels will cost between a few hundred dollars or well into the thousands of dollars range, depending on the attachments and models you prefer. On the off chance that you are simply considering whether clay is for you, it is suggested that you take a pottery class to find if your level, and love of the art, is sufficiently high to legitimize buying your own pottery wheel. Don't have your mind set on a beginner's wheel. 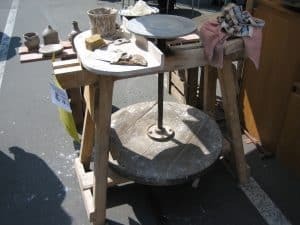 In the event that you are purchasing your first pottery wheel, it might appear to be suitable to start with a pottery wheel designed for beginners. However, this is not always the best answer. Considering a long-term purchase when making your final financial commitment is highly suggested. The explanation of this is your wheel will keep going quite a while. With proper maintenance, an electric wheel last on average, 10 years, while a kick-wheel can last forever. 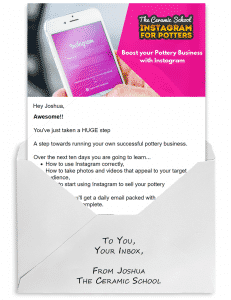 Consider your present needs as well as your long-term objectives in pottery. You want a wheel that will keep on meeting your needs as you develop and create as a potter. Deciding between an electric pottery wheel and a kick-wheel is a very personal preference. 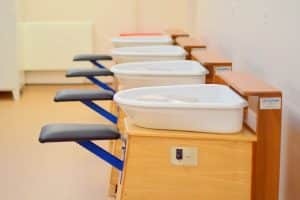 Electric pottery wheels allow you to center faster, allow you to choose the rotational speed of the pottery wheel precisely - variable speeds allow you to easily switch between centering, throwing and trimming. Kick-wheels allow you to connect more with the clay - it's more romantic just using your hands and feet - without the use of modern technology. It is harder to learn though - as you have to first learn how to rhythmically push your feet and keep the speed consistent, while also trying to use your hands to make the pot! If you really can't decide between an electric pottery wheel vs a kick-wheel, you could always buy a kick wheel and then buy a motor to fit on it - so you have the option of using both! For kick-wheels - the "horsepower" is actually the weight of the wheel & the power in your legs. The heavier the kick-wheel is, the more potential torque it will have, and the longer it will keep spinning for you. For electric pottery wheels, the horsepower of the motor determines the maximum amount of clay you can center. Typical electric pottery wheels range in horsepower from 1/4 HP, up to 1 HP. Some electric pottery wheels with 1 HP can center up to 150 lbs of clay at a time with ease. So if you are feeling confident and know you want to throw large - get a powerful motor. Smaller motors are also fine, but you may find that the wheel slows down when you apply too much pressure to the wheel-head. A Reverse switch on your electric pottery wheel allows you to throw or trim in the opposite direction with a simply flip of a switch. This is great for left-handed people, or if you simply want to mix it up a bit. Portability should be highly considered when picking between an electric pottery wheel and a kick-wheel. The electric wheel model is quite often more convenient than kick-wheels. They are typically smaller and by nature weigh significantly less. Portability is important because most potters move their studio furniture around from time to time. (e.g. mopping up the studio floor every day, or simply to get a new perspective). It's also worth thinking about if you will be staying in the same studio for the next few years, or if you will be moving to a larger studio. Having an easily portable wheel also opens up the opportunity of giving live demos at exhibitions, arts and craft shows or festivals. Wheel-heads are the flat, metal discs, which you throw your clay on. They come with or without the option of pins to secure bats placement. There are wheels that have bat pins that are effortlessly removed, enabling the potter to trim the ware specifically on the wheel-head. However, the majority of flat wheel-heads do accompany bat pins, but the pin configurations can be unique: Pins can differ in number, size and distance from the middle of the wheel-head. In the event that you have bats that you need to keep using, you'll need a wheel-head that corresponds with the correct pin layout. Check out our guide on Pottery Bats. Flat wheel-heads likewise come in various diameters. At least 14" is usually desired, as it allows you to throw platters, extra large pots or other ceramics with a wide base. You will require a wheel-head sufficient in size to suit your work. Some models of pottery wheels are extremely fundamental, comprising of nothing more than a wheel-head, a power source (engine or flywheel) and, its frame. Other pottery wheels come with joined work tables, and, some with or without raised edges. 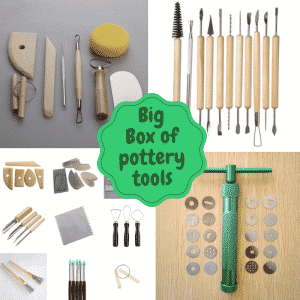 Such work-space additions are great for storing your Pottery Tools, and can come in various sizes and locations in relation to the wheel-head. Gather as many facts needed in order to make the best choice in choosing the best set-up for your own particular style. Consider, as well, if you would rather make your own particular work surfaces. 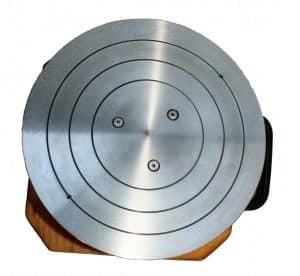 You can always buy a pottery wheel splash pan later on to affix to your pottery wheel, and depending on your make and model, they can cost anywhere from $50 to $200. For the accomplished and novice craftsman, there is nothing more critical than a high-quality pottery wheel. Picking the correct type of pottery wheel is important for making pottery pieces that you'll cherish. With wide choices of items from various brands that will make making symmetrical, beautiful pottery agreeable and simple. With prices to fit nearly every budget, you can invest your money into your inventive side with no stress. High torque engines that keep running smoothly, cast aluminum heads, and fans to scatter heat guarantee a solid item that you can use for quite a long time to come. Or, you can invest in a kickwheel. With this option, you get simplicity along with satisfaction in your product you produce with your own two hands. Whether you choose the electric wheel or a kickwheel, or even if you pick one then progress from there, make sure your investment is the best value for your money. Research the different pottery wheel brands before making your final decision. From there search for the best price by either shopping online or utilizing local businesses to make your purchase. There are also many videos online that will allow you to watch each machine while in use to get a closer look at what each has to offer. Also, take advantage of user reviews to get a clearer perspective on what previous consumers have found to be both positive and negative about the product you are interested in. When possible, try to buy a pottery wheel from a local distributor, as they will most likely have someone to come out and fix your pottery wheel if it ever breaks down. Fancy buying a used pottery wheel? Then take a look at our used pottery wheel checklist - which lists everything you need to know before buying a used pottery wheel.